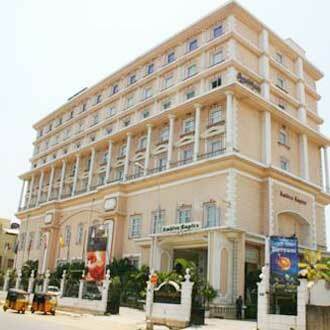 This 3 Star hotel of luxury is strategically positioned at Vadapalani Andavar Temple. Its regal interiors houses 80 rooms, which are decorated with rich colors and vibrant artwork. Guests can dine-in either at Royal Palate - a multi-cuisine restaurant or at Green Chillies - a 24 hours coffee shop, and can also lounge at Million Dollors - a pub. A business center is there to facilitate business guests with business facilities, which is complemented with seminar and conference halls.